To our way of thinking, there is nothing that compares with a handmade stringed instrument in the hands of a skillful player. Down at the Bolen Studio, such players come in every day. And we count ourselves fortunate when they do. In fact, at any given time, all across this country, morning noon and night, you will find folks playing music. Guitars, mandolins, dulcimers, banjos, fiddles, even ukuleles are being put to good use, gracing someone’s day with real, live music. Though often taken for granted, stringed instruments have always been with us almost since the beginning of mankind itself. Archaeologists have found harps dating back to the land of Ur of the Chaldees in the time of Genesis. Very early in our own American history, variants of the harps, things like “zitters” and “scheitholts” could be heard ringing through the hills and hollers along with fiddles. And very early on, African slaves introduced an instrument which was to become the banjo. In times of hardship and strife, our Civil War, the Dust Bowl, mining disasters, shipwrecks . . . stringed musical instruments were there to help us make songs that soothed us in our hour of mourning. 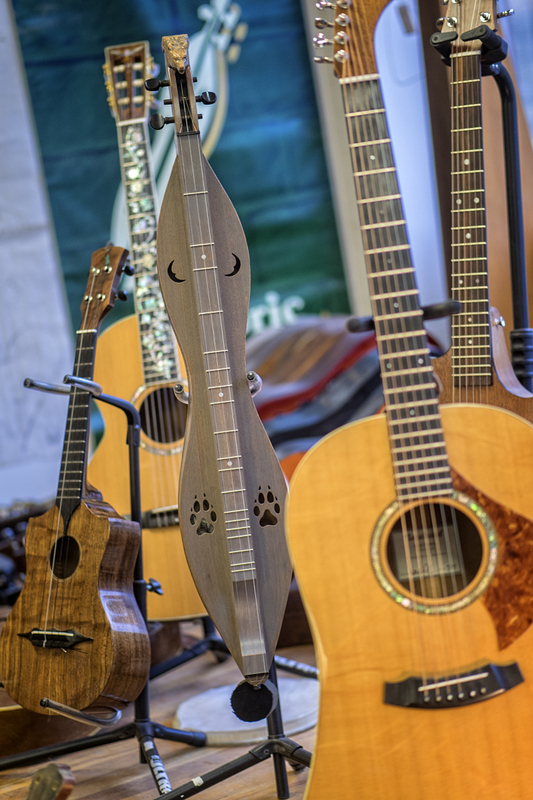 In the hands of the lyric poet-troubadours, iconic artists such as Jean Ritchie and Bob Dylan, stringed instruments have served as vehicles within which our dreams have ridden, carrying our imaginations away. Whether it was the dark drama of Pretty Polly or the idyllic longing of Roy Orbison’s Blue Bayou, music held the power to transport the listener far from the rattle and hum of ordinary day-to-day living. In the hands of the late Doc Watson, the Gallagher guitar became like a pitcher pouring sparkling clean mountain spring water over weary souls longing for home. And Chet Atkins? Well . . .
Granted, we are only are talking about artifacts here, man-made tools. But they are key tools for us to use in the telling of our story. And long after our songs have been written, long after we’ve departed, many of these instruments will remain here after us, hopefully to be used, preserved, cherished, passed forward through the generations, surviving as tangible legacies in themselves. Telling those who come after us, for instance, the story of a tall man dressed in overalls who walked a mule cart down into Hindman, selling from it a new style of dulcimore which was unique to himself, along with the occasional jar of “cherry bark tea” in order to feed his twelve or so children. Or the story of a young widow standing over her slain husband’s grave, just killed by Confederate forces on Leatherwood Creek, playing the dulcimer playing until her fingers bled, singing all the songs she knew, over and over until the break of day, yet she still could not play her beloved back from the dead . . .
For each one of these stories, somewhere behind the scenes, there worked a dedicated craftsman, or a group of craftsmen. These artisans focused the best of themselves into their art, in order to make the finest instruments possible. Make no mistake; the vision and just plain hard work of men like Leo Fender, CF Martin, Orville Gibson and Kentucky treasure, Homer Ledford have shaped the culture and character of our region and our nation. Now, today, I stand before you a blessed man, privileged to be teaching my beloved craft to great bunch of folks right here in Downtown Hindman, thanks to your support of the Appalachian Artisan Center. My crew and I enjoy the creative process more than anybody has a right to. There are great things goingYou all should come down and see what we’re up to; it really does beat all. Perhaps someday all that will remain of our hard work, our dreams, of us, may be just that faded little label, squirreled away inside an old wooden box with stings on it. But that’s okay. Because if you’ve made that thing and put your whole heart into doing it, then that pencil-scrawled name will always have a meaning, a meaning that any skillful musician can feel, right there in his own two hands. By God’s grace may each one of us be remembered for something so good. "My experience working in the luthiery was awesome! The people are great and friendly! You can’t ask for better teachers as they are patient and address any questions you have. Most importantly they want to make it special for you. They want it to be personal and extraordinary. I can’t wait to go back and learn more."